The Museum of Cultural Heritage was open on May 29, 1999. This museum presents the works by those Ukrainian artists who were compelled to live abroad. The collection of the museum is exhibited in eight halls of the old restored house. The museum building is the architectural monument dated to the end of the 18th century-the beginning of the 19th century. 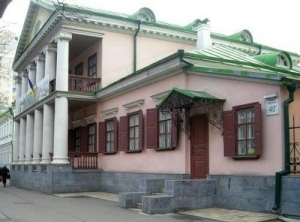 The remained oasis of old Kiev, the old-fashioned building in the very center of Pechersk (one of the most famous areas of Kiev) became the «family home» to many members of the Ukrainian Diaspora who had been working abroad for many years. The exposition of the museum deals with the life and creativity of composers, choir masters, writers, poets, choreographers and singers who were born in Kiev, got education here and had been working in the city for a long time and then somehow were forced to leave their native city. It became possible only nowadays that themselves and their creative achievements are known not only to the specialists in the field of fine arts but to a great number of people who love and value Ukrainian culture and arts. There are paintings of such well-known Ukrainian painters as L. Morozowa (USA), O. Bulavitsky (USA), M. Krychevsky (France), T. Messak and V. Savchak (Australia), V. Krychevsky and K. Krychevska-Rosandich (USA). In the museum one may learn about the life and creativity of such writers and poets as D. Humanna (USA), O. Hay-Holowko (Canada), H. Cherin (USA), B. Olexandriv (Canada), B. Kowalenko (Australia). The world-famous ballet-master and dancer S. Lifar and the pianist-virtuoso V. Horovits were also born in the great city of Kiev. Visiting the museum's halls visitors are able to get acquainted with the biographies and creative activities of these famous people. The Museum of Cultural Heritage also holds a number of personal and subject exhibitions, such as Stepan Kalinovich Yaroviy and Anna Ravliuc exhibitions and a huge exhibition called «Ukrainian Life Reflected in Post Cards». The eighth hall is completely dedicated to the memory of famous ballet-master and dancer Serge Lifar. In the third hall there are works of Krychevsky's family exhibited. The fifth hall is dedicated to the Ukrainian press and second hall committed to the creative work of the Ukrainian Diaspora. The main aim of the museum is to return the rich national heritage of great Ukrainian masters to their motherland and to present it to real culture and arts buffs.